What is the date of the last letter please? 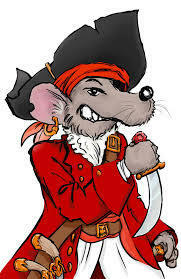 As administrators of the dockyard, would respectfully request a reply regarding the M.O.D. and its cover up of tons of Asbestos ships lagging dumped in the location known as the burning ground, the so called clean up operation that took place for nuclear material, in my view was a sham, to mislead the search for contamination, my own witnessed account took place during the late 60s and my concerns are that being located so close to the River, seepage will eventually take place, if not already the M.O.D. are accused of not reporting this dumping and therefore gross negligence, I wait for your considered reply. The Admirals offices are now leased out to private companies so not sure who has ownership of the basement area. I would suggest - do the research, find concrete evidence that the tunnels are there. Put together a costed project plan, with a detailed risk assessment and method statement and put it to the Trust. The worst they can do is say no. Hello all, sorry this is a bit late ref. Admirals office. I worked in the yard right up till it closed. I was employed as a health physics monitor in the nuclear power department. Points to be monitored in an incident. I recall one point was in and around basement tunnels in the admirals office,. This is an interesting one! While I worked in the Admirals' Offices for the Dockyard Trust there were a number of rumours of tunnel links to other establishments. Indeed there are some bricked up doorways in and around the basement area, one in particular is at the rear of the building and looks like a WW2 period build. The brickwork blocking it has some fairly substantial electrical cables going through it. If STEVEG4HGE says has a personal recollection of the tunnel then for now we must give it some credence, until someone proves it doesn't exist. It is similar to the naysayers regarding the underground Operating Theatre supposed to be at Medway Maritime Hospital. Many say it is just a rumour and it doesn't exist, yet in the undercroft of the hospital there is a bricked up doorway exactly where the access tunnel to the underground facility is shown on plans to have entered the main buildings. I for one lean towards the possibility of there being more tunnels and underground establishments in the Medway area than we are aware of. One intriguing one mentioned in official War Diaries is the Kitchener Deep Mine. I do have a tunnel layout map and will dig it out later to see if it helps shed any light. There is no evidence of any tunnels apart from the three access tunnels entering HMS Wildfire. I feel this may be another local myth or confusion between sites. I left the Admirals staff in 1976 on appointment to HMS Tiger so cannot say what happened after that time until the closure of he yard. Of course the cup of tea was normally the secondary reason for coming into the offices. The Admirals offices are now leased out to private companies so not sure who has ownership of the basement area. As you went through the main door you were met by the Head Messengers desk which was a large round affair that sat in the middle of the main entrance way. On the walls either side were the boards which listed all the Admirals of the Nore and Flag a Officers Medway. These are now in the dockyard museum. If you turned to your right you had the Admirals writers, Flag Lt and Captain of the Port. At the very end was the Admirals Office. If you turned left you had the Operations Room, Staff Commander and the Registry. At the end was the RN Communications Centre. If you walked directly ahead you would meet the stairs to the upper floor, walk beyond these and you found the officers heads (toilets) and then the stairs down to the basement. The underground communications centre at Wildfire was used during WW2 as the Admirals Operations Room and the tunnel linked the two so was vital. Local rumour had it that the German Air Force attempted to hit the tunnel on more than one occasion and indeed my Fathers family lived in Admiralty Terrace and their house was hit in one attack with my Uncle saved by a rather substantial table. One suspects that this was indeed local speculation and the target was the main sheds and slipways at the top end of the yard. That is a hell of a long tunnel to pop along for a cup of tea! Seriously does anyone else have any record of this? Presume the tunnel must still exist? If so it raises the intruiging possibilityof access to 'Wildfire' from it still! Further to your comment about the basement being used as an air raid shelter in WW2. I was on the Admiral`s staff during 1975/76 and can identify that there was a tunnel running from the basement to the underground communications centre that was located at HMS Wildfire, Prince Arthur Road.There were two maintainers based in the tunnels at that time, one a Chief REA the other a civilian from the Post Office who looked after the Creed 7B teleprinters. They often would come through the tunnel to the basement to have tea in the wireless telegraphy office. A couple of extra photos. 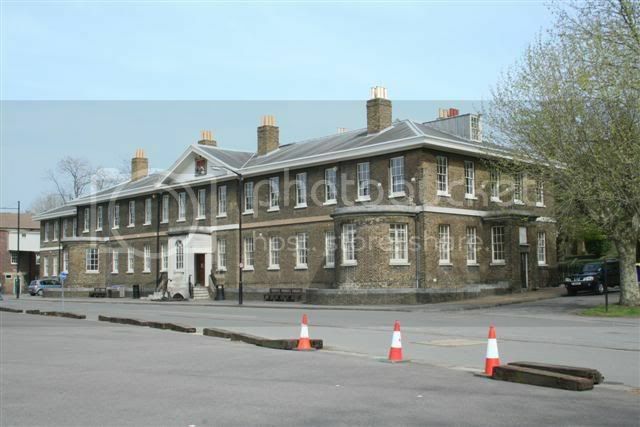 Designed by the navy boards architect, Edward Holl, and built in 1808, this office building is now a scheduled Ancient Monument. 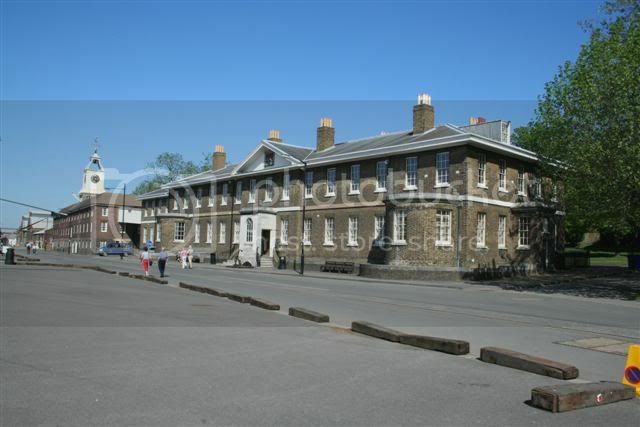 The offices were for the use of the Master Shipright and other principal officers working at the dockyard, it is constructed of brick with a low roof so as not to disturb the view of the Officers Terrace behind the building. The building has been in use as the office's of the Port Admiral and was extended to the north and east. The northern extension was used as the dockyards communications centre in the 20th century and is still in use today as office accommodation. The basement was used as an air raid shelter during WWII.